The most fully-featured, best looking and finest sounding keytar around. It improves on the well-established AX-Synth in all the right places. A deep, customisable sound engine with a vast array of waveforms and effects. No DAW editor and the editor app feels unintuitive at times. Back in 2009, we got our hands on Roland’s AX-Synth, its previous flagship keytar. The AX-Edge certainly has the ‘wow factor’ in the looks department (which is ultimately what you want from a performance instrument that’s going to take centre stage)! Available in white with standard black/white keys and silver and gold ‘edge blades’ (the blade is a customisable/ removable strip running along the edge) or in black with a black keyboard and red/silver blades, the AX-Edge is the most striking-looking keytar range we’ve seen and we’d have no qualms getting out front with either model strapped on! Build-wise, Roland is using the same tough but lightweight plastic casing found on many of its synths (including their JD-XA) and certainly, there are a few design cues that tie the Edge together with the JD range, including the same keybed as the XA. Once strapped on, the Edge feels very nicely balanced and the various strap attachment positions allow comfortable single-handed and dual-handed playing too. Generally, everything is where you would expect it to be - under the neck you’ll find controls for hold (sustain), portamento on/off and unison, along with an assignable wheel and volume dial. Roland provides rubber rings to place on these dials to make them more grippy too. Further to this, the programme-changing buttons are now within much easier reach on the neck and there are now two displays; one for deeper editing and a large three-digit patch number display, so you can always see which patch you are on clearly in the heat of performance! There are seven assignable buttons too (but alas, no D-Beam!) and the familiar modulation bar and touch-sensitive control ribbon from the AX-Synth can both be freely assigned to control onboard parameters/functions. The Edge’s new sound engine is surprisingly deep with a huge number of wide-ranging waveforms available for all styles of music (making it a very serious second-tier or main synth). You can edit many key parameters/functions onboard or use the Bluetooth editor App to go deeper (we’d love a full Mac editor too). There are four parts available per-programme with four partials per-part and to add to the versatility, there’s splitting/layering, favourites, a very comprehensive effects implementation, a decent vocoder (with jack mic input) and importantly everything sounds on the money too. 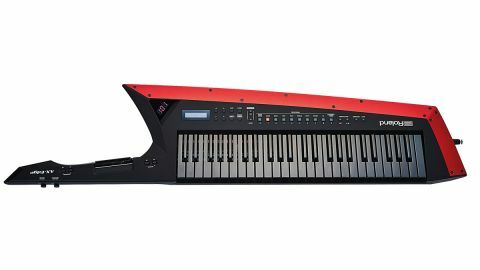 To top things off, the Edge also features Bluetooth MIDI, battery power, flash drive storage, standard MIDI, and 256-note polyphony; this really is Roland’s finest keytar yet, in terms of looks and features. If using a keytar is your signature, then the AX-Edge is unquestionably the one to own/play!